Credit: NASA/IoA/AC Fabian et al. Like a spoon moving through hot soup, the massive elliptical galaxy near the top of this image has cut a swath across the dense, hot gas in this crowded galaxy cluster known as Abell 1795. This smoothed Chandra X-ray Observatory image of the galaxy cluster A1795 shows a bright filament some 200,000 light years in length. The gas in this structure is denser and cooler (30 million compared to 50 million degrees) than the surrounding gas. The filament was most likely caused when an enormous elliptical galaxy (white spot at the head of the filament) moved through the cluster core. 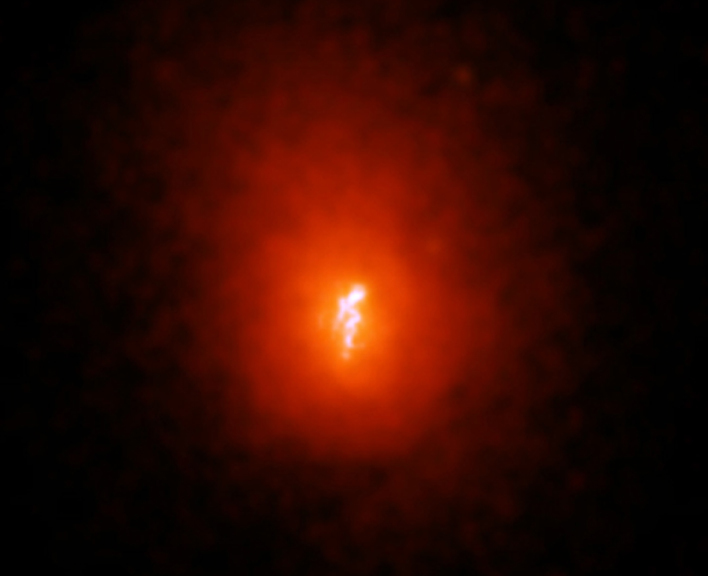 Hot gas spread throughout the cluster is drawn by the gravitational field of the giant galaxy into a cosmic wake of cooling gas, which appears as the long string-like feature in the middle of this image. Most observed galaxies in the universe appear in groups ranging from simple pairs and trios to complex clusters of thousands. Scientists find these clusters immersed in haloes of hot gas. Through time, this "intracluster" gas loses energy through X-ray radiation, cools, and flows toward the dense core of a cluster where it may form stars. This phenomenon is known as a "cooling flow." The latest Chandra research on Abell 1795 was conducted by a team led by Professor Andrew Fabian of the Institute of Astronomy, Cambridge, England, using the Advanced CCD Imaging Spectrometer (ACIS) instrument aboard Chandra. Chandra observed Abell 1795 for 19,594 seconds on December 20, 1999, and then for 19,421 seconds on March 21, 2000.
Credit NASA/IoA/AC Fabian et al. 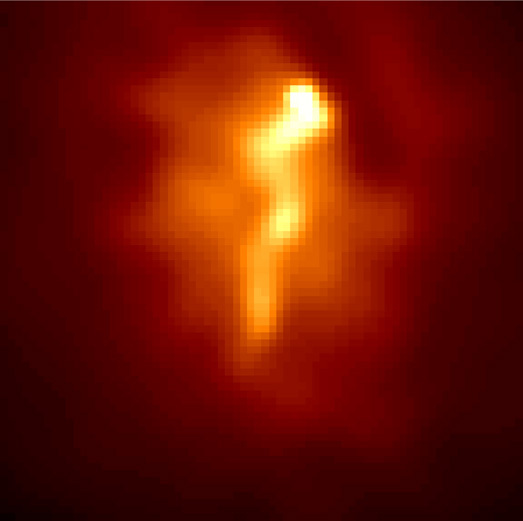 Scale Image is 75 arcsec across.